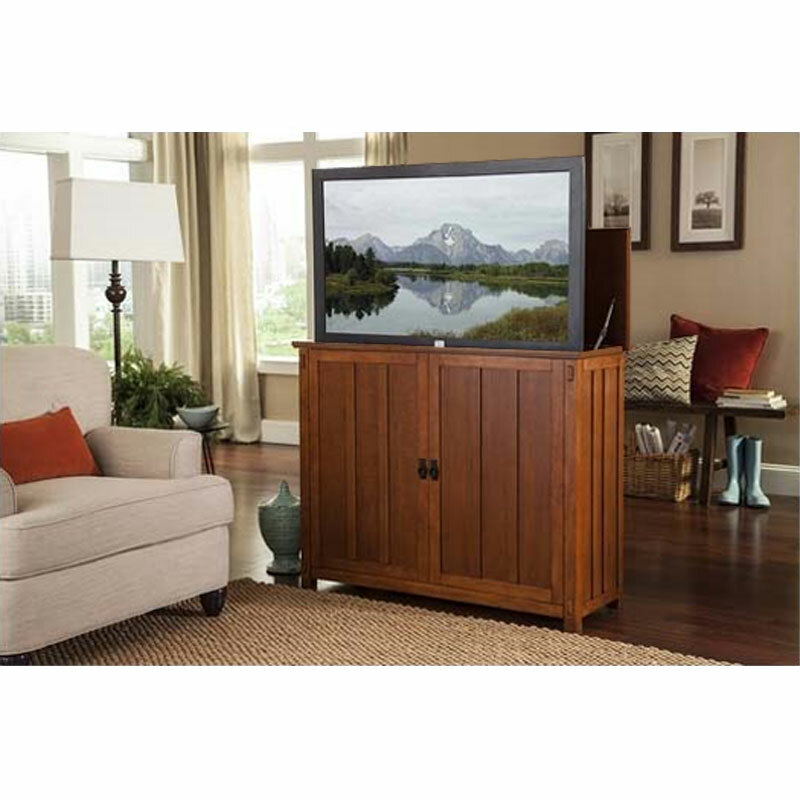 More on the Touchstone Elevate Mission TV Lift Cabinet for 24-46 inch Screens (Light Oak) 72006 below. 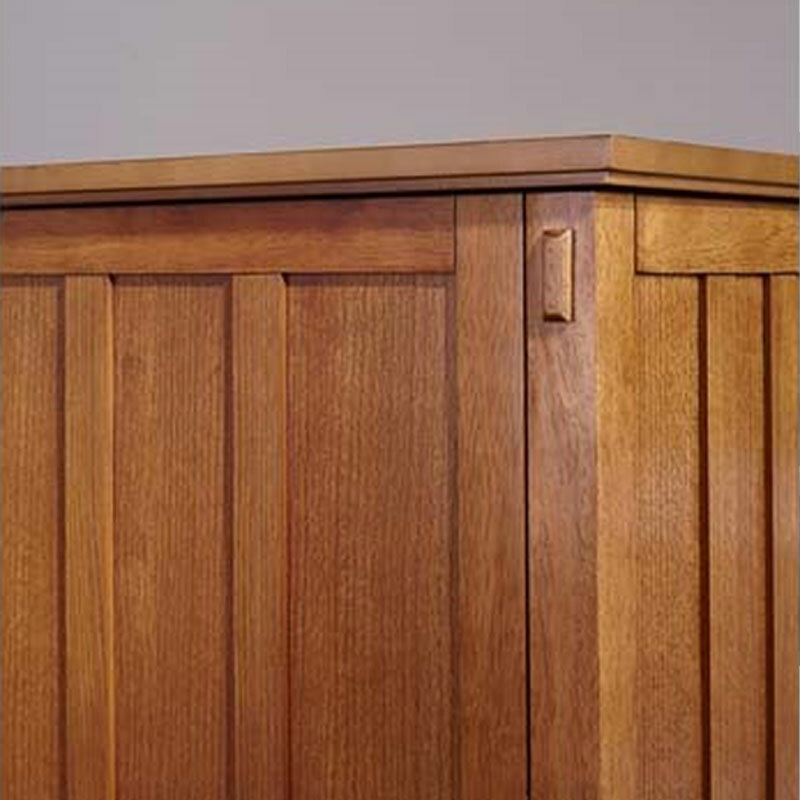 The Mission Elevate Cabinet features a beautiful light oak finish and a sophisticated Arts and Crafts styled design. 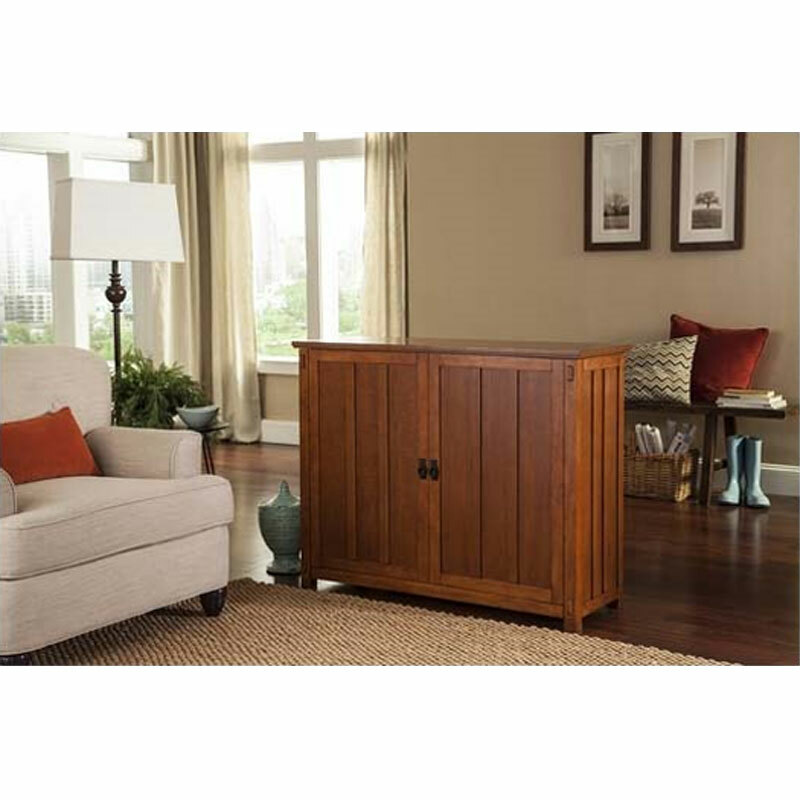 The Missions recessed paneling, unique detailing and distinctive oak wood offer warmth and unique style in your family room, living room or bedroom. The black cabinet hardware is consistent with the Arts and Crafts style, with a handsome antique finish. The smaller size of the Mission Elevate makes it a perfect fit for any room in the house. Like all Touchstone Elevate cabinets, the Mission Elevate is completely finished on all four sides, giving it the versatility for both the end of the bed or against the wall placement. Don't let the smaller size of this cabinet fool you, it can still hold most 46" diagonal flat screen TVs. Four-sided finish allows unit to be placed at the end of the bed or in any room. Universal TV mounting bracket for all VESA compliant flat panel TVs. Fully raises or lowers in less than 30 seconds. Inside component space of 17.5" W x 12.625" D on left & right side bottom of cabinet. Measurements must include cords & plugs. 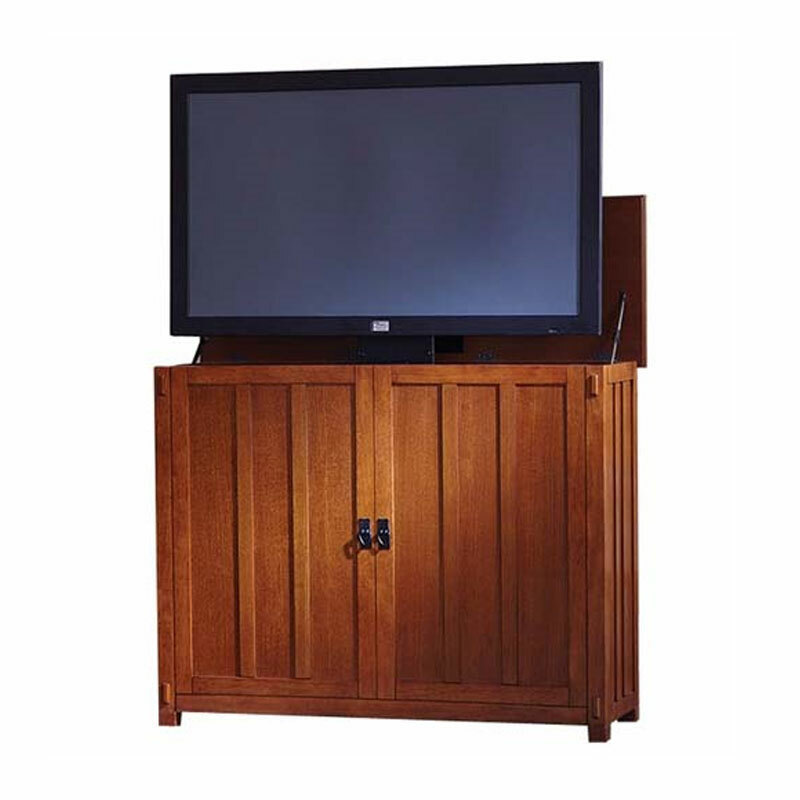 TV Lift system fully extended reaches 65.5"
Pop out front cabinet panel provides easy access to lift and electronics inside the cabinet. Elevate TV lift cabinet is shipped direct to the customer by standard curbside LTL. Factory Lift Installation available for an extra charge. Maximum TV weight (without stand): 100 lbs. Cabinet weight with lift: 160 lbs. Total shipping weight: 194 lbs. Click HERE for a video introduction featuring the Elevate Mission Lift Cabinet. Whisper Lift II Pro Advanced has the same features as the Whisper Lift II but also features an adjustable lift height, RF to IR Conversion Kit for use with IR compatible remote controls and the control box allows for controls through RS232 commands or a 12v trigger. Whisper Lift II Pro with Swivel has the same features as the Whisper Lift II Pro Advanced but also has the ability to swivel up to 60° (+/-30° depending on screen size). Touchstone's swivel also has a safetly feature, where the lift will not go down unless the TV is back in the "home" position. The add-on component shelf is the perfect solution for adding extra storage space for your cable box, DVD player, game system and other components onto the Elevate lifts. 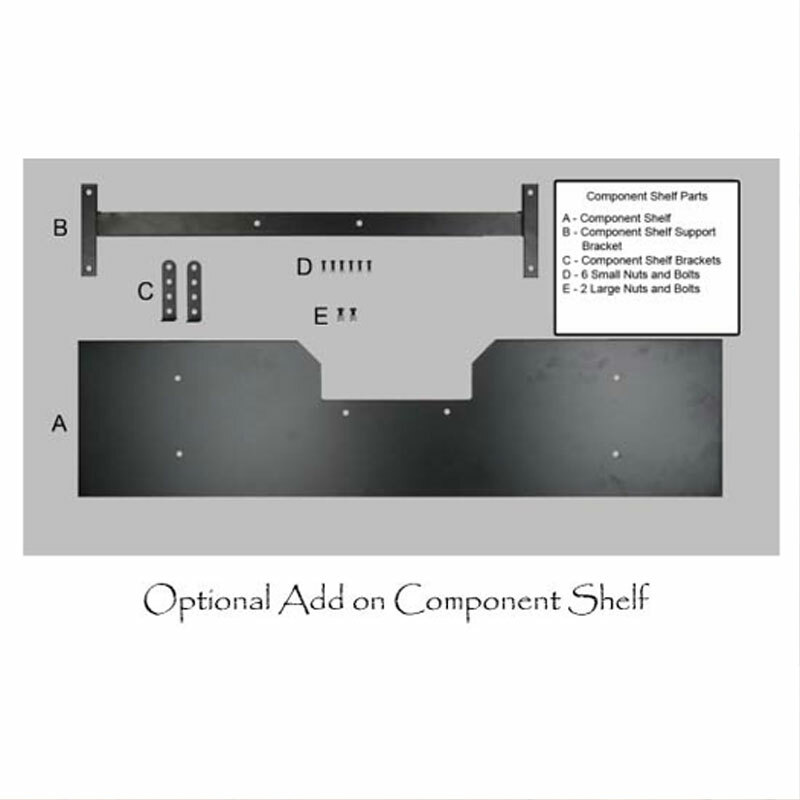 The shelf measures 40" W x 9" D with an area of 16" W x 9" D on both the left and right side and includes all the necessary hardware and instructions to help guide you through installation quickly and easily. This option extends the operating range of your hand-held remote controller. It includes everything you need to hide all your audio/video equipment behind the closed doors of the cabinet. Your entertainment center can remain closed with your equipment out of sight. LTL-Curbside Delivery - The Elevate TV Lift Cabinets require minimal assembly upon arrival. The cabinet and lift mechanism are shipped together in two packages on one pallet and can be easily installed in just minutes by securing a few easy bolts to the base and back of the cabinet.Touchstone offers step by step instructions for a head-ache free installation as well as additional phone or online support to assist you in the set up of your new TV lift. Pre-Assembled with LTL Delivery - The lift mechanism is installed before shipment by Touchstone's factory trained staff so that your Elevate is ready to be used when it arrives. The LTL carrier will unload the cabinet from the truck and bring it to your front door. Pre-Assembled with White Glove Delivery - The lift mechanism is installed before shipment by Touchstone's factory trained staff so that your Elevate is ready to be used when it arrives. The LTL carrier will contact you to schedule a delivery date and time, bring the cabinet to your home, unpack the cabinet, install the cabinet in the room of your choosing, and remove all of the packaging. Standard 2-Year Warranty includes replacement of any non-functioning electronic parts, replacement of any non-functioning lift parts, Free Toll Free tech support and coverage of InfraRed repeaters. 5-year Extended Warranty extends the coverage of the standard warranty to a full five years from date of delivery. It covers the lift motor, lift mechanism, control box, hinges, and hard-wired manual switch plus it includes protection against any accidental food or beverage stain, accidental chipping or gouges to wood, accidental breakage of any glass, heat marks, water rings, warping & lifting of veneers. Range of Screens Supported: 21 to 27 in., 28 to 32 in., 33 to 38 in., 39 to 42 in., 43 to 50 in.